The Journal is a tool with which you can record your thoughts and experiences online. 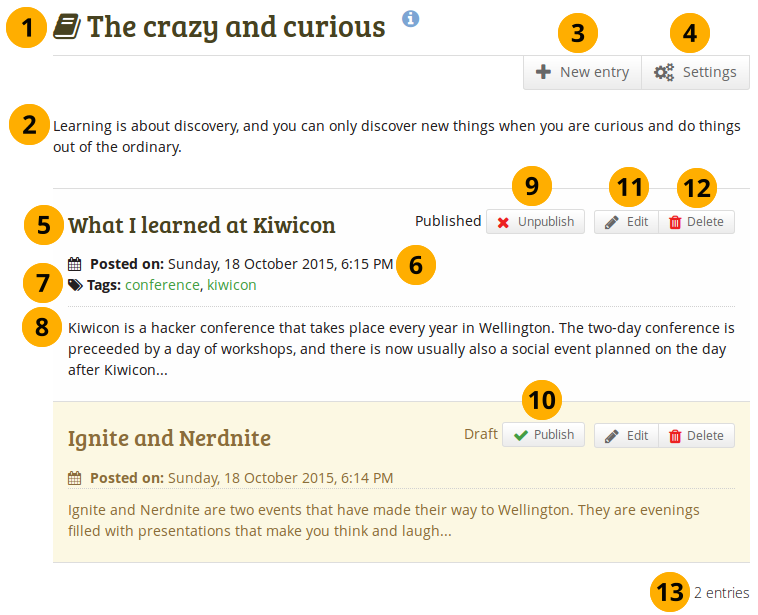 By adding your journal or individual posts of it to a page you can allow other users to place feedback and comments on it. Thus, you can create a dialogue with your audience. 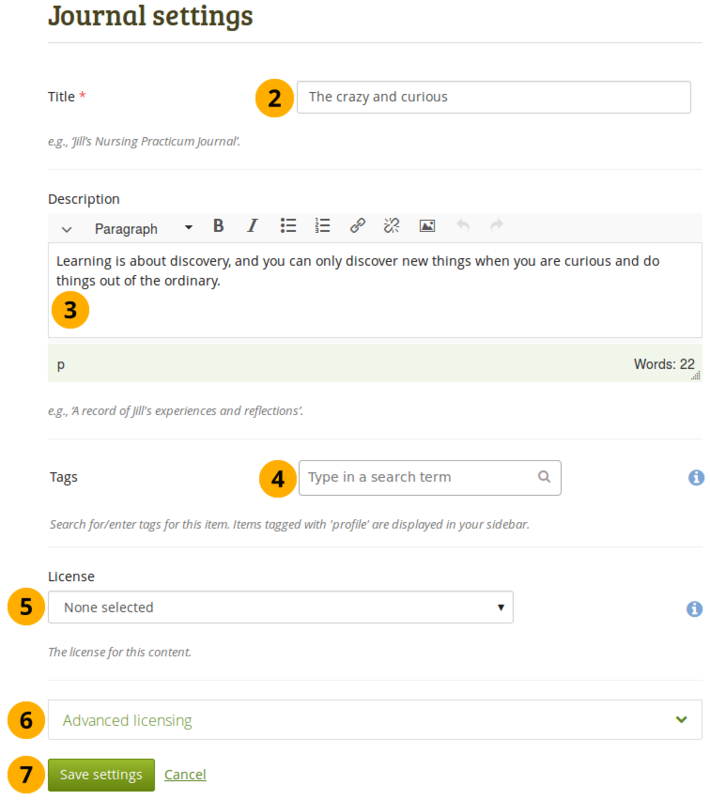 Per default, every user has one journal available. You can also have multiple journals. Click the New entry button to create a new entry in this journal. Click the Settings button to change certain journal settings (see below). If a journal entry is labeled Published, you can click the Unpublish button to revert it back to draft status. If a journal entry is labeled Draft, only you can view it. You can then click the Publish button to publish this entry to your journal for others to see when it is included in a page. When you publish a journal, you do not automatically make it available to others or make it public on the internet. The journal or journal entry still needs to be put into a page that is then shared with others in order for them to see it. to make changes to your journal entry. to delete your journal entry. You can change the title of your default journal (and all others if you have enabled multiple journals) and add a description as well as tags. Click on the Settings button of your journal. Title: Change the title of your journal. This is a mandatory field. Description: Add a description for your journal. You can format it as you wish. License: You see this field if the site administrator turned on license metadata. Choose the license for the journal. You can set your default license in your account settings. Advanced licensing: You see this option if the site administrator turned on license metadata. 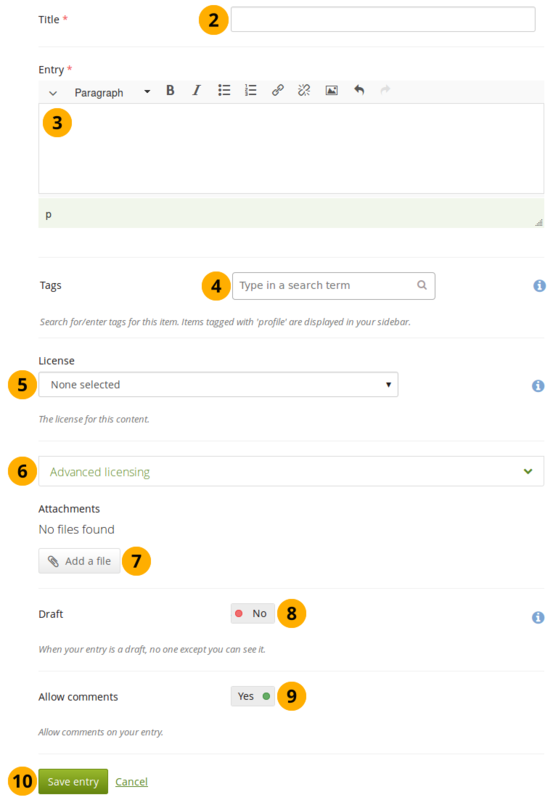 If you click it, you see two additional license fields, “Licensor” and “Original URL”, that you can fill in if this in not your own journal. Click the Save settings button to save your changes or the Cancel button to abort your changes. You write your entry and save it. In a page, you choose one of the journal blocks that suits your purpose best. You give those who shall see that page access to it. Post your journal entry by following the steps below. In your journal, click on New entry. Title: Provide a title for your journal entry that expresses what you are writing about. This field is mandatory. Entry: You must also write some text, add pictures etc. The visual editor helps you format your journal entry. This field is mandatory. License: You see this field if the site administrator turned on license metadata. Choose the license for the journal entry. You can set your default license in your account settings. Advanced licensing: You see this option if the site administrator turned on license metadata. If you click it, you see two additional license fields, “Licensor” and “Original URL”, that you can fill in if this in not your own journal entry. Attachments: Add an attachment or more to your journal entry, e.g. PDF files associated with it or images. You can add files either from your files area or upload new ones directly onto your journal entry. Draft: Mark your entry as draft if you have not finished it yet. This is especially helpful if you have published your journal in a page, but do not want anybody to read this particular entry (yet). It is always visible to you, but not others. Allow comments: Change the status of the switch box to “Yes” if you want to receive comments on the journal entry. Click the Save button to save your entry or the Cancel button to abort your changes. When you attach files directly to a journal entry, others can see them whenever they have access to the journal entry. Alternatively, you can upload additional files directly. License: You see this field if the site administrator turned on license metadata. Choose the license for the artefact that you are uploading. You can set your default license in your account settings. Licensor: You see this field if the site administrator turned on license metadata. If you are uploading a file that somebody else created, you can attribut the work to them here and provide their name for example. Original URL: You see this field if the site administrator turned on license metadata. If you are uploading somebody else’s file, provide a link to the original Internet address so that others can go there and view the original file. If you wish, you can have your uploaded images resized automatically if they are larger than the recommended size. You can only see this option if the site administrator made the image resizing option available. Click the Browse button to select a file from your computer to upload. 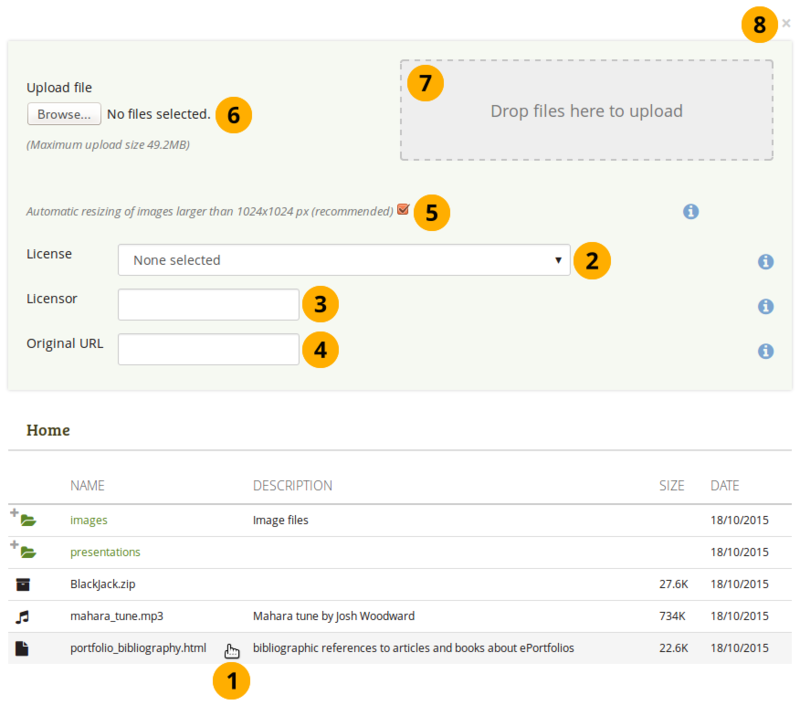 Instead of clicking the Browse button to upload files, you can drag and drop files from your computer directly onto the “drop zone”. You must still observe the maximum file size upload for each file and the maximum total file size cannot be exceeded either. This functionality is not available in all browsers. Generally, users of Chrome 7+, Firefox 4+, Internet Explorer 10+, Opera 12+ (Windows only) and Safari 6+ can use drag and drop. If you wish to use more than one journal, e.g. to put your writing into categories for making all posts from one category available in a page without having to select each journal entry, you can go to your Settings and set the switch box for Multiple journals to “Yes”. Once you can create multiple journals, click the Create journal button to set up a new journal. All your journals are listed on Main menu → Create → Journals with their titles. The titles link through to the individual journals.